This is the campaign log for the Fourteenth session of a google+run Wandering Heroes of Ogre Gate campaign. The previous session is described HERE. Chen and Zhou Gui face off. San noticed something odd about Gui's movements and spotted a martial expert pulling from a balcony as if Gui were his puppet. Bone Breaker immediately stopped the match and detained the expert (named Wang Shi). He revealed he had been paid by Zhou Gui to assist him. Bone Breaker decided that resuming the match would be okay and he allowed Wang Shi to continue manipulating Gui's movements from the side of the ring. Chen eventually knocked him out of the arena with Blast of the Dragon, causing Gui to be disqualified. After the match Bone Breaker spoke with Zhou Gui and Wang Shi. Both agreed to enter his services (Gui for 40,000 spades a month and Shi for 10,000 a month). Zhou Gui promised to prepare a meal of Longevity Duck for Bone Breaker and his guests. He was directed to the kitchen, and on his way Chef Wu followed him (apparently the two had a working relationship of some kind). Bone Breaker called an end to the fights for the day and invited the remaining competitors, and six of the biggest gamblers, to join him. At the dinner there were several incidents. The first occurred when Fearless Cat and Nergui (a Kushan tribesman), refused to come to the meal, preferring to train. They were sent messages that they would be disqualified if they didn't participate. Nergui intentionally arrived smelling foul, while Fearless Cat was impolite. Bone Breaker took them outside with some of his men and threatened to have them killed if they didn't show respect to him as host. For the rest of the evening they presented no further problems. The arrival of the Longevity Duck prompted another incident. The dish was presented when Bone Breaker noticed that there were suspicious cubes of meat in a sauce drenching the duck. He asked Zhou Gui what the meat was and he said he couldn't reveal it, as it was a secret ingredient. Bone Breaker became more insistent saying that Gui could just whisper it in his ear. Leaning in Gui told him that it was human meat but that it would rejuvenate him and give him a longer life. Bone Breaker told the guests that the cubes were human meat and invited those willing to try but perhaps eat around the flesh. He and another guest, a merchant named Master Han, ate the duck and found their minds were more nimble for the next few hours. Over the course of the meal the party formed several agreements with three of the merchants in attendance. Master Han, a silk merchant, came to an arrangement where the party gained 50% of his business if they supplied all the silk for free. Master Fan, worked out an agreement as well. Some of the guests were local scholars and expressed only disgust at Bone Breaker's behavior. When they left for the common area to drink, Chen followed and sat down with them. Chen asked the scholars if they knew of an artifact he might seek out to gift to his new Sifu, the Venom of Zhaoze. They reprimanded him for associating with a poisoner but one of them suggested he consider seeking the Emerald Monk, a legendary statue. According to the monks, the Emerald Monk was a student of Sunan and Bao known for his vanity. He made a deal with the Demon Emperor, who promised to make him immortal and beautiful for all time. But the longevity elixir the Demon Emperor gave, turned him into solid emerald. Bone Breaker then spoke with his wife, telling her of the arrangement he had made with the Senior Grand Councilor (to make their son the vessel of the Demon Emperor's spirit). He didn't say an agreement had been struck but acted as if he were still making a decision on the matter. She was outraged, and said that "no" was the only permissible answer. He let the issue go and tried to think of alternative solutions. That night, Bronze Master arrived at the inn with two prisoners: Lingsu and Min (members of Purple Cavern sect that Bone Breaker had been trying to kill). He presented both as wedding gifts and told Bone Breaker he shouldn't kill Lingsu right away as the man was quite knowledgeable. The next day the tournament resumed. The final bout was between Chen and Yang Tuo. 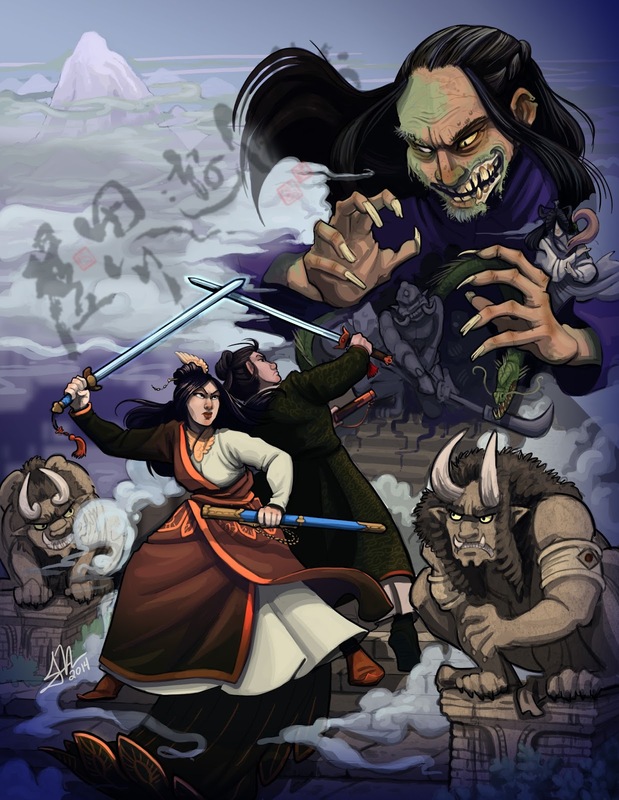 Chen relied heavily on his Blast of the Dragon Technique, while Yang Tuo used both the Sword of Sun Mai (a powerful phantom sword technique) and the All Encompassing Emerald of Sun Mai (a ball of green energy that crushes foes). Some of the fight also involved an exchange of kicks and counters. By the end, Chen was far more wounded than Yan Tuo, but he managed to knock Tuo off the edge of the ring, winning the tournament. Bone Breaker presented the Jade Turtle to Chen and then approached Yang Tuo in the ring asking if he would join them, promising a considerable sum of money. Yang Tuo appeared interested and confessed that he came only as a pilgrimage to see the Jade Turtle for himself. If he could touch it that would satisfy him, and he would be wiling to work out an arrangement with the party. 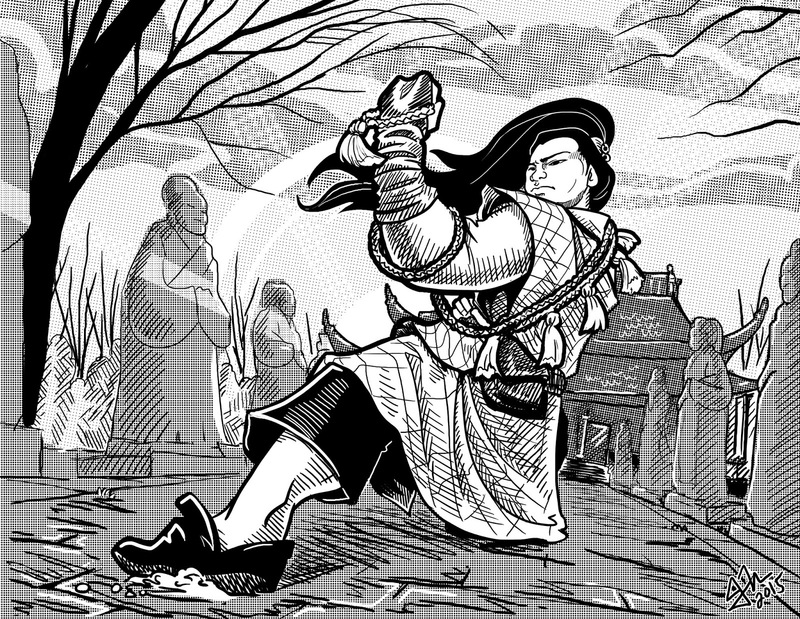 Bone Breaker told Chen to hand the turtle to Yang Tuo, and Chen obeyed with some reluctance and suspicion. As soon as Yang Tuo had the Jade Turtle in his hands, he tapped it in in a pattern and it exploded in golden light, creating a column of energy that carried Tuo into the sky and formed a dome around the entire area for about a kilometer. From high above, Yang Tuo said "You brought this on yourself Bone Breaker". The party sent men and archers after them, but the pillar protected Tuo, burning anyone who approached into ash. Everyone inside began to feel sick and woozy. Bone Breaker tried to flee with the help of Sand Demon, burrowing below the dome, but its arm was burned off as soon when they reached the boundary, forcing them to retreat. San tried to reason with Yang Tuo, saying that many innocent people (there were about 2,000 locals attending the tournament) would be affected. Yang Tuo told San that no one there was innocent and then told a story about a man named Xi Kang, and a woman named Zhi Zhu, who had gone to the Pagoda of Golden Mercies and saved the spirits of people trapped inside by tapping the power of the Jade Turtle. He accused Bone Breaker of murdering them while they were on their way to return the turtle to Iron Sky Maiden at the Face of Vaagu. He also accused Bone Breaker of stealing the face of Vaagu. Eventually everyone passed out and found themselves inside the dome, with the landscape much changed. Where the tournament had been, there was now a giant Pagoda rising up from the sand. Everyone felt fatigued and drained of all emotion. 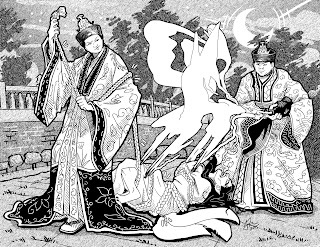 They found Lingsu, and he explained to them that he was with Kang and Zhi Zhu at the Pagoda of Golden Mercies but that the Jade Turtle behaved very differently there. He told them that an entire town of people were imprisoned inside (or at least their Dragon Spirits were imprisoned inside). He believed it was a trap intended to purify and that if they cultivated they could escape, but that would take years, if not decades. Plus he said time seemed to pass faster on the outside than the inside. Bone Breaker, Chen, San, Abbot Firebrand, Jade Priestess and Lingsu went into the Pagoda. There they found a tall statue of Hen-Shi surrounded by floating miniature statues of Hen-Shi made of gold (Lingsu informed them these were known as Golden Mercies). A set of stairs led up to another level. They heard a voice that said "Reflect. Reflect and overcome the obstacles. Cultivate and I will release you." This is all an illusion, but all too real. There is another path, a faster path. Find the Golden Lamp, bring it here and face the obstacles within. When the lamp radiates golden light, sink with it to the bottom of the waters of reflection. San brought this information to Bone Breaker who rounded up some of his men to find the lamp. It was in a nearby cave but radiated red rather than gold. They took the lamp down the stairs and went into the chambers beyond the door. There they found several powerful entities of considerable size. The first was a giant and twisted creature shrouded in billowing white robes spanning an entire room of jagged rock and water. When they brought the lamp into its presence and attacked, it was slowly drawn into the device. They attacked it and a spinning back kick from San sent it into a million pieces as it was fully absorbed into the lamp. When it was done, found that their sadness had returned. They continued on through several chambers and halls with similar creatures. They faced a burnt creature of rage and hate that lobbied fire at them, a giant woman who healed and then sliced their bodies with her hair, and more. Some were harder to defeat the than others. San and Wan devised a twin kick technique that enabled them to maximize their damage against the creatures and this helped them trap them in the lamp. Each defeated foe helped them regain their emotions. There were other creatures in the tunnels as well, some with no form at all. Finally they found a smiling monk with a staff in a chamber filled with luscious fruit trees. He greeted them and pounded his staff on the ground, causing the energy from the lamp to flow into his weapon. The party sprung into action against the spirit. He smiled and offered them a place to eat or talk, while biting into their necks and draining their blood. When he attacked it revealed rows of razor sharp teeth. But his politeness and exuberance never diminished. 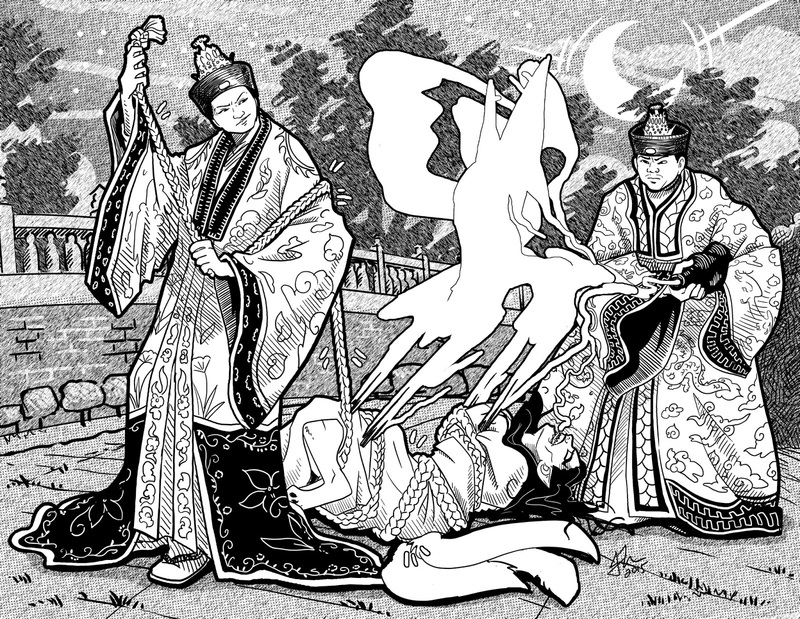 San and Wan were able to defeat him with their twin kick technique, drawing his energy into the lamp. Once he was inside, the lamp glowed a golden light and they continued south deeper into the caves. At the end they found a massive body of water at the bottom of a chasm. They went back and took some key people with them (Bronze Master, Bone Breaker's Wife, Fearless Cat, etc) and all plunged with the lamp into the underground ocean. After sinking a considerable depth, they awoke by the inn. There were thousands of bodies around them, frozen like statues but made of flesh. These were the people they left behind, their bodies remaining as phoenix ghosts.